The upper part of these Hiking pants is made with Elio Antibacterial Flex 24 airprene - a perforated 1,5mm neoprene with an inner antibacterial & anti allergic thermo lining. This material provides warmth & comfort for the torso. When the core (torso) is warm it readily releases blood to the extremities. 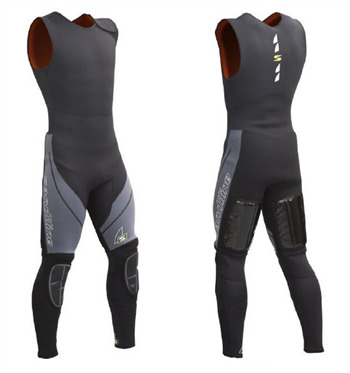 When the body is overheated the holes in the neoprene allow the skin to breath & some sweat to wick away from the body helping the cooling off. The antibacterial & anti allergic properties of the inner lining help preventing odor and rashes. To achieve durability and comfort the back side is made with 6,5 mm small diamond neoprene, the 3,5 mm K1 neoprene on the thighs makes the pants rigid where needed, the back of the knees & other parts where elasticity is needed are made with 2mm and 3 mm superstretch neoprene, the lower leg is made with 3mm small diamond neoprene to make the pants resistant to abrasions and more durable.